Emily is a project coordinator for CompassPoint and is a key team member in ensuring that participants in our Cohort Leadership Programs have transformative learning experiences. They love both working behind the scenes and connecting directly with nonprofit leaders to ensure that their learning experiences with CompassPoint help them to further their goals of equity and justice. Before joining the CompassPoint team, Emily worked for BRIDGE Housing, a nonprofit affordable housing developer in San Francisco, where they supported the compliance team in project management and annual reporting. 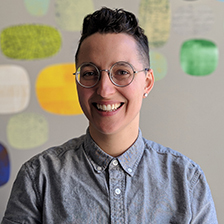 They also hold many years of team leadership experience, both in a professional capacity as well as through volunteer work as the coordinator of the Queer Resource Center at Brandeis University. Through these roles, they also discovered their love for training and capacity building. Emily is particularly passionate about prison abolition and prisoner rights. Having been connected (through Black & Pink) to an incarcerated pen-pal for several years, they support various national prison abolition organizations and encourage folks to reconsider the role of prisons in society. Emily grew up on the East Coast and misses summer but does not miss winter. They love eating ice cream (which they also make in their spare time), swimming in the ocean, and reading radical science fiction that imagines new liberated futures.